A new change announced by the Church of Jesus Christ of Latter-day Saints will dramatically impact the face of scouting in Utah and in Sanpete County. In a joint statement on May 8, the LDS Church and the Boy Scouts of America (BSA) announced that effective Dec. 31, 2019 the church will end its relationship with the organization. “In this century of shared experience, the Church has grown from a U.S.-centered institution to a worldwide organization, with a majority of its membership living outside the United States. That trend is accelerating. The Church has increasingly felt the need to create and implement a uniform youth leadership and development program that serves its members globally. In so doing, it will be necessary for the Church to discontinue its role as a chartered partner with BSA,” the statement declared. Since the vast majority of Boy Scout troops in Utah are sponsored by the LDS Church, this represents a sea of change for BSA. 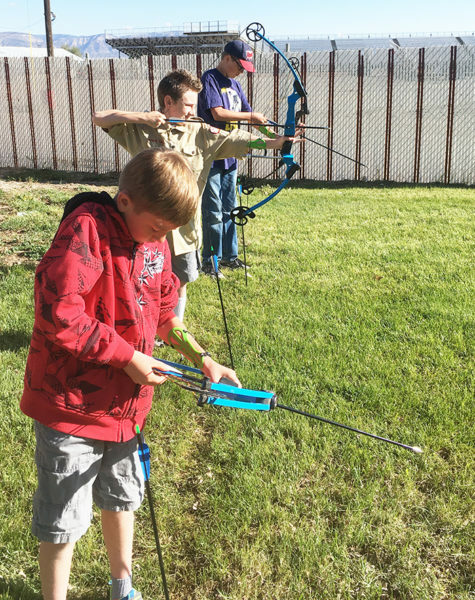 Wallet Everett (front to back), Rylund Holster and Austin Thomas enjoy an archery activity at the Scout-O-Rama in Manti on Saturday, May 19. BSA Arapeen District Executive Rawlin Bagnall acknowledged the change came “very, very quickly” and compared it to coming down to breakfast to find out your parents are getting a divorce. Bagnall said while 93 percent of Scout units in the Utah National Parks Council are sponsored by the LDS Church, they represent just 18 percent of the national total of 2.7 million BSA members. Currently there are approximately 89,000 boys from 270 LDS stakes enrolled in Scouting in the Utah National Parks Council. This is the local council of the BSA that serves Utah youth who live south of Salt Lake County. It is headquartered in Orem. 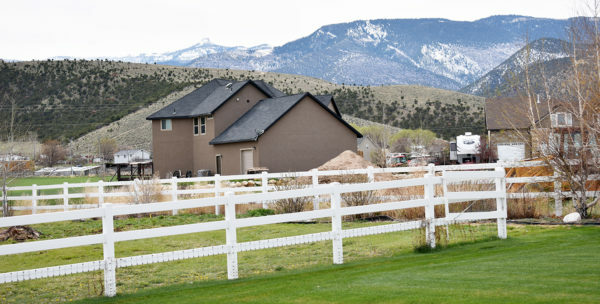 With the change, Bagnall anticipates there will be at least one community-sponsored troop, possibly more, in bigger towns in the Arapeen District, which is comprised of Sanpete, Sevier, Wayne and part of Garfield and Millard counties. Sanpete County has approximately 4,100 registered Scouts. His best guess is that about 20 percent of the boys currently enrolled will join those troops and remain active in Scouting. In Sanpete County that’s about 800 boys. Bagnall also anticipates an influx of girls with the recent change in BSA allowing girls to join the organization. The LDS Church did not incorporate the change with its sponsored troops. Bagnall said while the organization will definitely be leaner, it will be filled with individuals who are passionate about Scouting and its principles, which will be a win for enrolled youth. He also anticipates a greater commitment from parents who choose to enroll their children in the community units. He said the new troops may also appeal to some who do not want to be affiliated with the church and even to those who, while active in the church, do not want to participate in its youth programs for various reasons. He also thinks there will be a resurgence of Scouting’s visibility in the community. In LDS troops, many youth and leaders have not bothered wearing uniforms while performing service in the community, for example. Over the next several months, Bagnall will be reaching out to local community organizations such as Lions and Rotary clubs, masons, Elks Lodges, chambers of commerce and even schools, cities and businesses to sponsor community units. He has already been contacted by several people who have expressed interest. Bagnall said the future of Scout camps like TIFIE will not be jeopardized by the change. TIFIE, which is paid for, is owned and operated by the BSA National Parks Council. Three years ago BSA started marketing the council camps to non-Scouts. Now one third of groups who utilize them are non-Scout groups. The TIFIE Scout Camp is located at 7500 feet above Mount Pleasant. It is a full service camp that provides merit badge and adventures for Scouts. Since the LDS church has said its new youth initiative will have a strong outdoor component, Bagnall said its likely there will be a strong need for facilities like the 12 council camps so he anticipates most of them will continue to operate. aren’t we all a little bit Scandinavian? I just happen to have Scandinavian roots, complete with a trove of wonderful old black and white photos of somber-faced Danes, and handwritten accounts of that arduous transatlantic crossing, followed by an even more arduous overland crossing from American Eastern Seaboard to the western frontier. And you probably do too, since a popular ancestry website claims that most Americans have at least some Scandinavian DNA in their overall makeup. My wife shares my Danish heritage, as do many of my local friends and neighbors, which is not surprising given the fact that Utah is second only to California in percentage of citizens with direct Danish ancestry, and that most cities in Utah seem to have a particular section of town that was once known as Little Denmark. And even if you might happen to be that rare exception in these parts with no Scandinavian blood whatsoever in your veins, you are likely still influenced by the rich Scandinavian heritage that makes up this lovely valley they helped settle, and that we now call home. And hopefully you can feel some adopted pride in sharing in that part of this local legacy. Scandinavians were specifically chosen to settle this sometimes harsh Sanpete environment because of their robust and hardy natures, along with their resourceful skills and expert craftsmanship. But I, even with my strong Danish roots, am five generations removed from those hardy and skillful ancestors of the 19th Century and have a hard time repairing even a sprinkler-head in my perfectly placid backyard. So I’m not going to talk about skirmishes with local Native Americans, or about eking a meager subsistence out of an often hostile and forbidding landscape, or about building a house, then a barn, then a granary with just my own hands and a few crude tools. I know I could never do any of those things; and if my own Danish progenitors, or those skilled Scandinavians who built the pioneer home I now live in, are ever cosmically mindful of me at all, they know it, too. Instead, I wish to highlight the fun times they occasionally enjoyed, those early Scandinavian settlers of this high mountain valley. There were the Easter celebrations, when the children would roll different colored Easter eggs down Temple Hill in Manti; and the May Day celebrations every spring, with the colorful Maypole Dance, and accompanying music; and everyone heading up into the surrounding canyons and hills, come springtime, to camp-out under the canopy of newly leafing trees; and feasting on red mush made from rhubarb, which was the first ready fruit of the summer season. There were brass bands and theater troupes and choirs, all performing plays and music brought over from the Old Country; and dances—lots of dances—which served the dual purpose of both lifting their spirits, and also effectively planning the rough-plank floors of whichever building they might happen to have gathered in for that evening’s hoedown. Don’t forget about the parades and picnics and carnivals and rodeos! Those things I could have handled, and still could, which makes me glad they are still enjoyed in abundance in our Sanpete Valley. The season for such commemorative merrymaking is upon us, as we celebrate our Scandinavian heritage in any number of annual festivals around the valley. Back then, those hardy Scandinavians would likely have walked to get from one place to another, while I will definitely drive my car to get to these various festivals (being far less hardy, as we’ve already established). But I will still revel in this rich Scandinavian heritage we all enjoy with traditional music and food and dancing and stories. I will feel glad for those robust and omni-capable forbearers who did all the difficult things that I could not so that I can spend my time in less laborious pursuits—such as reading about them, and reveling in them and the rich legacy they left and celebrating them every summer by consuming lots of ebelskivers, funnel-cakes and grilled Sanpete turkey! 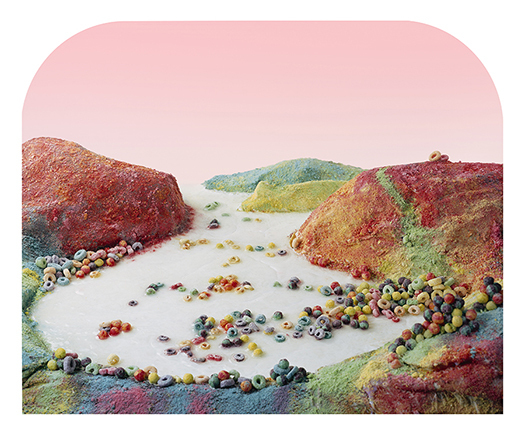 “Fruit Loops Landscape” is an example of social commentary by two collaborating photographers Barbara Ciurej and Lindsay Lochman. Their works can be seen at Granary Arts over the next four months beginning May 25. EPHRAIM—Granary Arts in Ephraim will offers three new four-month exhibitions beginning on Friday, May 25. Two are solo exhibitions—“Looking Forward, Looking Back” by Rachel Farmer in the CCA Christensen Gallery and “Concealed at First, at Last I Appear” by Amy Theiss Giese in the Upper Gallery. 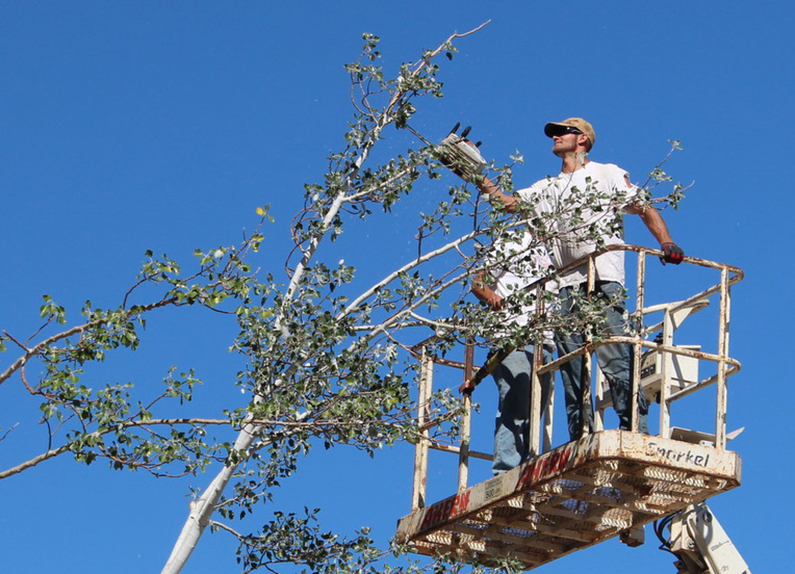 Farmer will be available on Saturday, May 26, at 1 p.m. for Gallery Talk at Granary Arts. The other exhibition is “Processed Views: Surveying the Industrial Landscape” by Barbara Ciurej and Lindsay Lochman in the Main Gallery. Farmer’s works are 12 unglazed ceramic miniature figurines depicting pioneer women in action displayed in three quilted landscapes. She has been working for nine years on a series that explores elements of her childhood experiences and her pioneer ancestry. Originally from Provo, Farmer works in New York City. She received a bachelor’s degree in ceramics from Brigham Young University and master’s degree in sculpture from the School of the Art Institute of Chicago. Giese’s exhibition combines photography of shadows cast in a room at night with a visual translation of sounds from the same room. “The shadows and sound have created a play of space and time that evokes rather than depicts reality,” according to press release from Granary Arts. Giese works in Boston and is the director of the master’s program of fine arts in photography at the New Hampshire Institute of Art. The exhibition of Ciurej and Lochman explores industrial food production at the intersection of nature and technology—a sort of commentary on processed foods. These two artists have collaborated for over three decades “on photographic projects that explore the confluence of history, myth and popular culture,” states the press release. Both are photographers. Ciurej works in Chicago, and Lochman in Milwaukee, Wisc. These three exhibitions will be on display at Granary Arts (86 N. Main St., Ephraim) from May 25 to Sept. 28. The gallery is open from 11 a.m. to 5 p.m. Wednesday through Saturday. More information is at www.granaryarts.org. MANTI—Rodger Marshall is changing the way we see the world around us—one creation at a time. Nestled in the heart of Manti’s historic downtown, his shop, R&D Creations and Antiques, has fast become a Sanpete County destination for antiques and collectables as customers seek out both the traditional and the unique. With a passion for the west, and the eye of an artist, Marshall has been quietly crafting for years some of the most outrageous yet beautiful pieces of furniture available, all by turning yesterday’s scrap into today’s prized living-room decor. His life, however, has been turned upside down. Marshall is fighting the biggest fight of his life. He is battling pancreatic cancer. But he is not alone. The community has rallied to his support. And he is still turning out creations while receiving treatment. If that sounds impossible, then you’ve clearly never met Rodger Marshall. Born to Bill and Betty Marshall in 1955, Rodger was raised in Levan, Utah. His early years were spent studying his father’s gift for recrafting odds and ends into new formations. Inspired by the endless possibilities, Marshall began to search out anything mechanical that his young hands could find. In 1972 at the age of 17, Marshall enlisted in the army during the Vietnam era in an effort to bring his mechanical talents into the service of his country. And while Marshall prefers to keep this period of his life private, it was on a fortuitous army furlough during the summer of 1975 that Marshall would meet his future bride, Diana, in Spanish Fork. The couple married soon after Marshall’s service ended and today, after 43 years of marriage, they are the proud parents of three children and seven grandchildren. Marshall received his technical training at UVCC as a clock smith and auto mechanic. This led to 36 years as professional automotive technician, 28 of those years being with the Ford Motor Company. Marshall was a recipient of the Ford Master Technician award, along with 143 certifications. That dream came true in 2014, when Rodger and Diana opened R&D Creations and Antiques at 37 N. Main St. in Manti. To visit Marshall’s shop is to visit a small slice of the old west – the outlaw west. As customers wander among a large collection of vintage furniture, they can view themselves in uniquely styled horse Hame mirrors, run their hands across end tables crafted from local barn wood or turn the dials of the outrageous and popular “steam punk” lamps and desks, which Marshall has created from an intricate series of lights, gauges, knobs and pipes collected from across the globe. Thankfully, that loyalty and friendship has been reciprocated. On February 17, 2017, the entire Marshall family was dealt difficult news as Rodger was diagnosed with pancreatic cancer at the Huntsman Center in Salt Lake City. But the Marshalls were far from alone in this fight. On January of 2018, Michelle & Dan Dalley of Lazy-D Pawn in Centerfield hosted a raffle to support their friend, and the community rallied to respond. Among the prizes donated to the cause were a Heritage Pistol donated by Lazy-D Pawn, a Winchester rifle by Ray Hartung of Centerfield, and “Bullet Tools” by Austin Keele of Panguitch. The fundraiser resulted in the raising of nearly $2000 for Marshall’s treatment, with the Winchester rifle being generously re-donated to further increase the money raised. 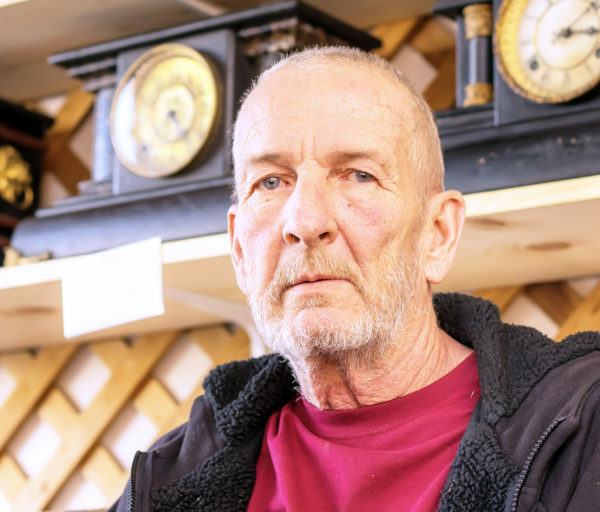 When confronted with the question of whether to keep his shop running, to continue to work on his projects or to change his outlook on life while fighting cancer with aggressive treatments, Marshall refused to back down. “I’ll live each day like I always have: for my wife, my kids, my grandkids, and my friends.” And if that sounds impossible, then you’ve clearly never met Rodger Marshall. Richard Bartolomew, Mark Bartholomew and Nathan Johnson are ready to help you with all your insurance needs, home, auto, and life. Risk Managers L.L.C. 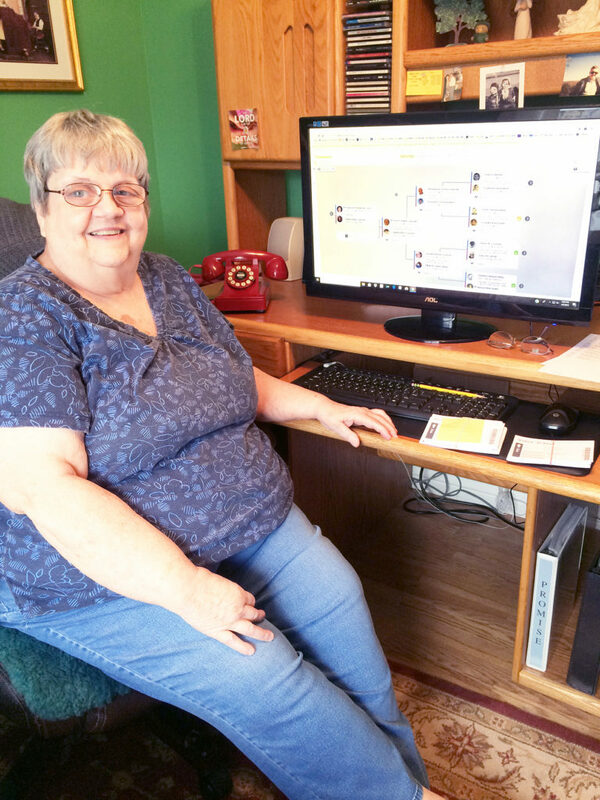 is a third-generation full service insurance agency located in Ephraim. It was started in 1954 by Glenn Bartholomew under the name Bartholomew Insurance Agency. Later, his son Rick joined him in 1968. In 1985, they changed the agency’s name to Risk Managers. In 1985, they merged with Risk Managers, LLC in Salt Lake City. The staff now includes son Mark Bartholomew and son-in-law, Nathan Johnson, with Bonnie Barton and Hailee Smith as customer service reps.
An independent agency, Risk Managers offers a full line of auto, home, business, life, health and farm insurance—“the whole nine yards,” Rick says. They represent many lines that they broker or sell directly including Liberty Mutual, Nationwide, Auto Owners, Progressive Travelers, Hartford, and many others. Risk Managers are particularly helpful in working with motorists with poor driving records. “We want to satisfy the customer—that’s why we’re here,” he adds. Office hours are generally 8 a.m. to 5 p.m. Monday through Friday, but at Risk Managers they understand that many people don’t get off work until 5, and they are willing to accommodate clients with after-hours appointments when needed. They even make house calls. While Risk Managers primarily covers Sanpete and Sevier County, they can provide insurance for anyone in the state. Some of their clients are along the Wasatch Front and in Nevada and California. 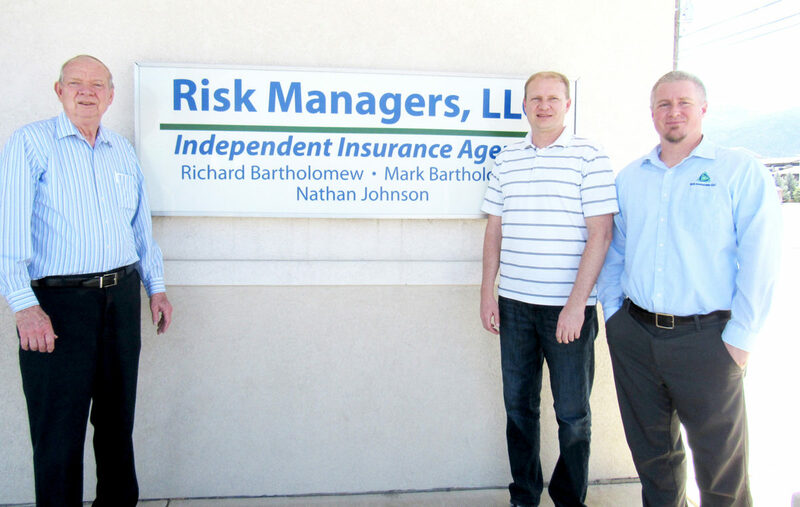 Since insurance is all they do, Rick, Mark and Nate can customize a policy to fit your needs. “We try to offer great service,” Rick says.